With respect to homicide investigations the rule of law is someone is considered innocent until proven guilty. In a jury trial the jury first listens to the prosecution who presents their evidence and testimony in an attempt to prove the person guilty. Next up is the defense that uses similar tactics to prove their client innocent. In capital cases the prosecution must prove with a preponderance of the evidence that the defendant is guilty BEYOND A REASONABLE DOUBT. If the prosecution cannot do so the jury must return a verdict of NOT GUILTY. In the Files case first Joe West * then Bob Vernon and now Mr. Dankbaar want people like me to turn the justice system upside down. They want us to start with the ASSUMPTION that Files is guilty BEYOND A REASONABLE DOUBT. As such they are no longer defending their client but acting as the prosecution. And many Files' supporters, because of Mr. Dankbaar's role reversal, should demand the proofs a jury expects from the prosecution. On a technical level I have no problem with this. But here is where the logic fails. Since this is the approach Mr. Dankbaar wishes to take IT IS NOT UP TO ME TO PROVE ANYTHING WITH RESPECT TO FILES. Since Mr. Dankbaar is acting as the prosecution the burden of proof of showing Files guilt BEYOND A REASONABLE DOUBT falls upon Mr. Dankbaar and any others who care to claim Files is the killer. So the issue becomes what ACTUAL VERIFIABLE DOCUMENTATION does the prosecution have? In fact all Mr. Dankbaar has to present in a real court of law is circumstantial evidence and hearsay. Claim: He says that he trained for the Bay of Pigs invasion at No Name Key in the Everglades. Reality: Look at the MAP of south Florida and the Key Islands shown below. No Name Key is located 50 air miles southwest of the Everglades. Claim: Files asserts there was a last minute change in the motorcade route. Reality: The physical proof that there was no change can be found in the Tuesday November 19th through Friday November 22nd pages of both the Dallas Morning News and Dallas Times Herald. Claim: Files claims he was involved with the mob as part of "The Chicago Family" [by timelines after September 1960]. He indicated the mob was headed by Tony Accardo and that Sam Giancana was an underling to Accardo. Reality: Sam Giancana became an under boss to Tony Accardo in 1946. Accardo turned complete control over to Giancana at a gathering held at the Tam O'Shanter Country Club in north Chicago in mid-1955. Claim: He says he left the Grassy Knoll area and went to the escape vehicle which was parked in the Dal-Tex parking lot. Reality: Aerial photography by freelance photographer Squire Haskins for The Dallas Times Herald show there was no parking lot associated with the Dal-Tex building. Claim: Files says he, Nicoletti and Roselli got into the escape vehicle and they left the scene by turning north onto Houston Street. Reality: Aerial photography by freelance photographer Squire Haskins for The Dallas Times Herald show the road was under construction, was blocked by barricades, and portions of the street didn’t exist. "The new Houston Street-Ross Avenue connection, in the lower part of the photograph, is expected to be completed by the end of this month, city officials announced. The new connection, which will cost $33,865, is expected to facilitate the flow of traffic through the warehouse area near the courthouse complex. The new courthouse rises in the background." Conclusion: There is a saying that extraordinary claims require extraordinary proof. And in the legal world someone who confesses to a crime without offering extraordinary proof can be considered to have an uncommon agenda or possible mental issues. And in this case some of those professing Files' guilt have a substantial investment in money and time. They MUST do everything they can to prove their client GUILTY. I have shown Mr. Dankbaar has nothing but circumstantial evidence. I have exposed five instances where Files' claims are not supported by the facts. It's not my place to try to convince anyone Files is guilty or innocent . However, if you want to reach a conclusion based on faith rather than evidence, if you want to excuse Files' errors in his statements, if you want to reduce the debate to name calling, then you are accepting the story with a almost religious fervor. However, no matter how much you and Mr. Dankbaar complain - no jury in the United States operates under the loose standards you wish them to rely on. The jury would have to return a verdict of not guilty. * Bob Vernon and now Wim Dankbaar have tried to portray the late Joe West as the man who cracked the assassination by discovering and then corresponding with James Files. What they fail to mention is that during the summer of 1990 and well beyond West was completely convinced the Grassy Knoll assassin was Roscoe White. He spent hours traveling around Texas with Roscoe White's son, Ricky, attempting to collect evidence of White's guilt. West even went so far as to conduct an "archeological dig" using a backhoe at the White summer cabin on Lake Whitney - absolutely nothing turned up. Additionally, West appeared on local Dallas and Houston television stations claiming he had a "taped confession" from a mob hitman from Dripping Springs, TX known as the "Black Ace." If the government would give the Black Ace immunity, Joe explained he would reveal the facts behind the assassination and how Roscoe White was involved. West made all of this information available prior to the JFK Assassination Information Center sponsored Ricky White press conference held on August 6,1990. And for those who might questions West's attendance supporting the theory his picture at that conference appears below. Even though the Roscoe White story collapsed under the weight of fabricated documents and evidence, West pushed on. 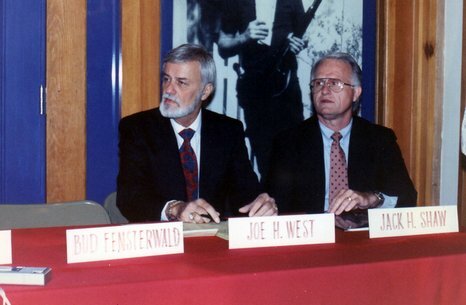 On August 20, 1990 West held a press conference in Houston, TX. White's widow had provided him with White's "military booklet" showing how Roscoe and others were involved in the plot. Some of West's associates including a former CIA agent refused to appear as planned because the diary was written in a type of pen that was not invented by 1963. The former CIA agent concluded "the notes are fabrications." Months later White's widow, Geneva, did confess the diary was indeed a hoax. By this time the Texas attorney general's office and Dallas County District Attorney John Vance considered West's outlandish allegations not to be credible. Even so, as reported in the Fort Worth Star Telegram of February 17, 1992 West soldiered on. Now he claimed he had more proof of White's complicity. This time instead of the Black Ace it was a "Mafia killer called Hugh," who said he stole guns used for the slaying and helped arrange several attempts [on Kennedy's life]. "Hugh has given me a two-hour statement on videotape and a sworn, 16 page affidavit detailing his story." West said. So after almost three years of trying to convince someone, anyone of White’s guilt West gave up on the case. But wait - just 33 days after his last press conference on March 22, 1992 he discovers a new shooter named James Files. And off goes the certified legal investigator, licensed by the State of Texas chasing a new windmill and using some of the same people and “evidence” he used in an attempt to prove White guilty. Over his career as a certified legal investigator and in spite of the warnings of some of his friends and associates, West was duped by Ricky White, Geneva White, the Black Ace, Hugh, and who knows how many other witnesses and hangers on. So why would Mr. Dankbaar be unwilling to disassociate himself from West and West's checkered past as an investigator? The reality is he can't because he would have to admit the proof that Files is the Grassy Knoll assassin was in part collected by someone considered a fool.